The History Girls: MRS WOOLF AND THE SERVANTS by Alison Light. A reflection by Penny Dolan. MRS WOOLF AND THE SERVANTS by Alison Light. A reflection by Penny Dolan. While visiting Helmsley Walled Garden, within the grounds of the castle, I was lucky enough to find MRS WOOLF AND THE SERVANTS by Alison Light, published in 2007, on the second-hand book shelves. A single scan of the book’s main headings drew me in: The Family Treasure; Housemaid’s Souls; The Question of Nelly and The Lavatory Attendant. Each is followed by a pair of names, one the famous writer and the other a domestic servant. Light’s Bloomsbury servants get almost equal billing with the famous social set. Light begins by pointing out that in the great Bloomsbury archives, there is little evidence of the other women who were part of households, the ones who “lived-in”, though far less comfortably, the same walls. Yet the free, independent and creative lives of Virginia the writer and Vanessa Bell the artist depended on the servants who worked for them: in other words, on other women not being free. Despite the silent archive, Alison Light noticed how frequently Virginia, Leonard and their circle wrote about their servants in their letters and diaries, and so she set out to discover these missing women. Light writes about three servants in particular: Sophie Farrell, who had first worked for Virginia’s beloved mother, charity-case Lottie Hope and the cook Nellie Boxall. She shows a pattern where servants often stayed for many years, although they were passed between members of the wider family as need or as tempers suggested, and poaching of prized servants was often attempted. The book is a pleasingly thorough inquiry, sharpened by having the viewpoint of someone whose own mother was in service. Light read unpublished letters and documents, visited houses and places where the servants had worked and interviewed descendants and local historians. She looked into their childhood homes, their education, the changing patterns of their employment and at the practical and emotional relationships that existed between a mistress and servant sharing the same roof year after year. I did enjoy the variety within this book. Thoughtfully written, each section opens with a long passage of Woolfian lyrical prose which contrasts well with Light’s brisker accounts of a world where long hours, the collecting of chamber-pots, the carrying of coal-buckets, the lack of hot water taps, the management of unreliable ovens, and days spent in dank basements or cold bedrooms were a constant part of the servants life. Incidentally, she makes it clear that the wealthy rarely saw any need for new labour-saving devices or domestic improvements: they already had household servants saving them labour. As the new century progressed, the distant mistress and servant relationship was harder to maintain. Back in 1892, Vanessa and Virginia’s childhood home, 22 Hyde Park Gate in Kensington, had been an elegant five-storied mansion where the servants slept in the spaces under the eaves or lived down in the basement. Almost two decades later, when Virginia and Leonard Woolf were running their small printing press at Hogarth House and Vanessa and Duncan Grant lived a paint-spattered bohemian existence at Charleston farmhouse in Sussex, there was only a wall marking the distance between the rooms of mistress and servant . Through several different lives, including glimpses of the Bloomsbury "stars", Alison Light brings in topics as diverse as the popular habit of “poor-visiting”, agricultural changes, the development of the kitchen and celebrity cooking for Charles Laughton. She looks at Virginia’s troubled life both as a feminist writer trying to develop a new style of writing and as an independent woman whose mental health forces her into dependence on her servants. Her own worst instincts often flare out against the servants but they seem to have a way of responding: an uneasy relationship that cannot have been calm. Furthermore, national events, such as the outbreak of war in 1914, epidemics, the growth of factory work for women, female education and emancipation, new taxes and economic depression brought on more social change. The ideal of “service” no longer fitted the modern world with its increasing demand for equality for all, and the Woolfs – and their servants – had to change along with it. Even so, I wonder how easily discussions went at the Labour party meetings at Rodmell House, which included the Woolf’s servants and employees among its members. MRS WOOLF AND THE SERVANTS by Alison Light was a useful if sometimes uncomfortable book to read. I enjoyed it because, from a writing point of view, one has to consider the role of any servants “attending” to a story set in the past, as appropriate to the time and place. Are the servants to be included or not, named or not? Are the servants who live closely with the family, like the Sterkarms in Susan Price’s historical sci-fi novels? Or are they hired servants and bearers, as in Sue Purkiss’s Jack Fortune and the Hidden Valley adventure? Or are they invisible, with the place run, like Nampara on screen in Poldark, with barely a servant evident? Or would they be no more worth mentioning than a washing machine in a modern house? I suppose it all depends on when: different times have brought different relationships, and that is maybe what I need to think about for the work in progress. 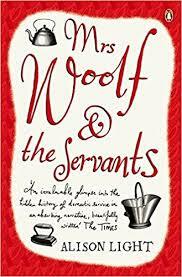 Moreover, reading MRS WOOLF AND THE SERVANTS rather makes one think about celebrity and other households and the kinds of domestic help and helpers that are needed today. Thanks for this, Penny - I'm off to get a copy - sounds like a fascinating read! You know, I've had this on my shelves for over a decade and STILL haven't read it... You've inspired to dust it down and open it up - thankyou!